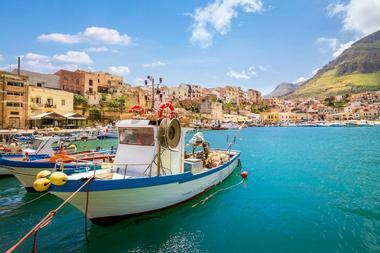 Sicily is a well-known island off the “toe” of the mainland “boot” of Italy. It is a popular tourist destination especially in the summer when many schools have breaks. The temperatures can reach the triple digits and room rates are high at this time of the year. During the winter, the temperatures are cool, there are far fewer crowds, room rates go down, but swimming in the sea is not an option. The months of May to June and from September to October are the best times to visit Sicily - the temperatures are pleasant, there are fewer crowds, and room rates are reasonable. January is the coldest month in Sicily, the largest island in the Mediterranean. This breathtaking coastal city sees an average low temperature of 41°F (5°C) while the average high temperature is a chilly 54°F (12°C). In February, this historically rich city sees temperatures holding steady at 54°F (12°C) for the high temperature average and 41°F (5°C) for the low temperature average. Sicily Weather in March: Temperatures see a small increase in March as the winter comes to an end and spring arrives in Sicily. The average low temperature increases by a couple of degrees to 43°F (6°C), while the average high temperature gets a single-degree bump up to 55°F (13°C). Rainfall is relatively low this month with 35 mm to be expected. In April, Sicily sees the average low temperatures rising by another few degrees to 46°F (8°C). Meanwhile, the average high temperature increases by a more significant rate to 61°F (16°C). May is a relatively dry month in Sicily with precipitation averages decreasing to 14 mm. The average high temperature increases to 66°F (19°C), while the average low temperature rises to 54°F (12°C). In June, summers tow in high temperature averages of 73°F (23°C). Low temperature averages see a 5-degree increase to 59°F (15°C). Sicily Weather in July: Things continue to heat up in July as Sicily’s summer continues. The average high temperature increases to 79°F (26°C) while the average low temperatures rise to 64°F (18°C). Beautiful sunny days can be looked forward to this month as it receives the highest daily average of sunshine in the year – 10 hours per day. Additionally, it’s the direst month of the year with just 10 mm of rainfall to be expected. August is the hottest month of the year in Sicily. While the average high temperature holds steady at 79°F (26°C), the average low temperature increases by 2 degrees to 66°F (19°C). Sicily’s beaches are sublime during this time of the year as sea temperatures are beautifully mild at 80°F (27°C). In September, autumn arrives to Sicily’s borders bringing with it cooler temperature averages. The high temperature average and low temperature creative a range of 75°F (24°C) to 63°F (17°C). October sees a moderate amount of rainfall with a precipitation rate of 48 mm. Average high and average low temperatures continue in their downward trend to measure in at 70°F (21°C) and 57°F (14°C) respectively. Sicily Weather in November: As the final month of autumn, Sicily sees significant drops in temperature in November. The low temperature average sinks to 50°F (10°C) while the high temperature average drops quickly to 63°F (17°C). In December, Sicily sees the most rainfall out of the entire year with a precipitation average of 79 mm. The average low temperature decreases to 45°F (7°C) while the average high temperature peaks at just 55°F (13°C). The historical city of Sicily appeals to all kinds of travelers no matter what time of the year it is. For example, travelers who want to explore the best of the city’s Greek temples will benefit from visiting in May or September when the temperatures are at their best. The best time to laze by the beach is in August when both the sea temperatures and daily temperatures are at their finest. Hiking is fantastic in between May to June and September to October thanks to moderate weather while those who want to catch the best hotel deals in town should plan to visit Sicily during the winter. Foodies can catch the Cous Cous Festival in September while beach bums can enjoy the World Festival on the Beach in May. For a small island, it comes as a surprise that Sicily has more than one airport. The Palermo Falcone-Borsellino Airport is located 19 miles west of Palermo. The Trapani Vincenzo Florio Airport is nine miles from Trapani. And the Catania Vincenzo Bellini Airport is four miles from Catania. 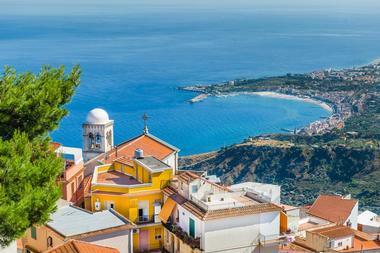 You can also arrive in Sicily by car, bus, or train. Sicily is well linked via sea to mainland Italy. Whether you arrive in Villa San Giovanni at the toe of Italy by car, bus, or train, your mode of transportation will be loaded on to a ferry or barge for its seven mile trip across the sea to the city of Messina in eastern Sicily. There are several ways to get from the Palermo Airport into the city. The Prestia e Comande Bus Service runs from the airport to the Stazione Central in about 55 minutes and to Politeama in about 40 minutes. The buses leave every 30 minutes. The Trapani Airport serves western Sicily. There are several car rental agencies at the airport. There is a bus stop in front of the exit of the arrival area to take visitors into Trapani. Taxis are also available. From the Catania Airport the AMT Alibus leaves the airport every 20 minutes and takes visitors into the center of Catania. There are also car rental agencies and taxis at this airport. Some people enjoy driving and there are many places in Sicily that can only be accessed by car. There are several car rental agencies from which to choose in Sicily. Whether you rent a car or bring your own on a ferry, beware of the fact that Sicilian drivers are known for being some of the most aggressive drivers in the world and often make up their own driving rules: drive defensively! A taxi is a choice for getting from town to town but taxis are quite expensive. Getting around by bicycle is another choice. 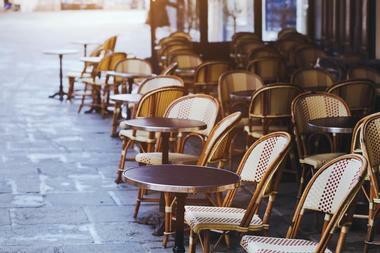 You can either rent a bike from a rental company or your hotel might help make arrangements for you. 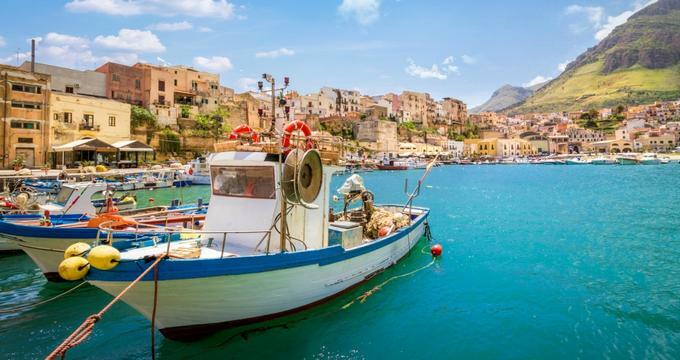 You can expect some tasty meals, especially freshly caught seafood, in Sicily, but some restaurants are more well-known for their location and spectacular views than for good food. This is not always the case, but in many cases the better the view, the more you’ll pay and the quality of food will not be high. Whether it’s outstanding or average, you can look forward to an appetizer such as rice croquettes, cazzilli, or crispeddi before your first course of fresh fish, seafood, or meat arrives. Some other tasty things to try include the olives of Nocellara del Belice, prickly pears, capers, tomatoes, and grapes. And don’t forget to try Sicilian pastries made from ricotta cheese and almond paste! Shopping in Sicily is not about buying world-famous products with designer names attached: it is about buying things that can only be found and bought in Sicily. It is also about shopping outdoors: don’t leave Sicily without trying one of the many outdoor markets. There is an antiques and crafts market held on the second weekend of each month at Mascalucia between Catania and Nicolosi. Here you will find unique wooden puppets and colorful ceramics decorated in botanical motifs. Local organic produce like wine, sun-dried tomatoes, and chickpeas are sold in Palermo. 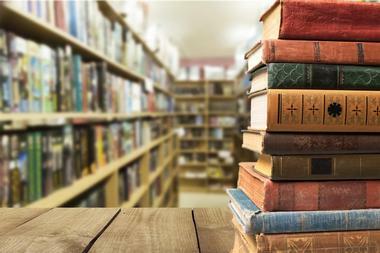 Other things to shop for include antiques, artifacts, handbags, handicrafts, jewelry, and leather products. 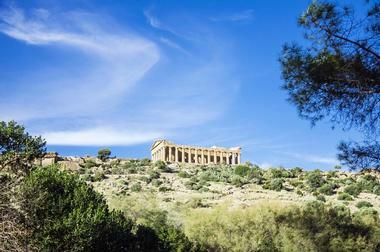 Sicily is a fascinating island made up of distinct regions each one waiting to be explored. Palermo is home to the Norman Palace, the Palatine Chapel, the Quattro Canti, and the three historic markets of Ballaro, Capo, and Vucciria. The west is known for its olives, sea salt, Alcamo and Marsala wine, old windmills, fishing, and ancient Greek and Carthaginian ruins. 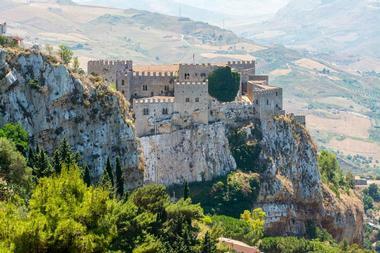 Central Sicily is agricultural country with wheat fields, fruit orchards, and citrus groves. The south is known for agriculture, fishing, vineyards, sheep, and ancient castles and other ruins. There are lush forests and hidden villages in the northeast. And dominating the east is Mount Etna, at 9,843 feet high, Europe’s highest and most active volcano. 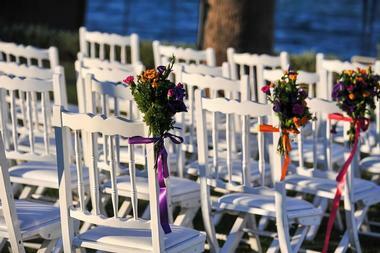 Sicily has some of the most beautiful landscapes in the world, so it is a fantastic choice for a wedding. Foreigners can get married in Italy but it requires a certain amount of paperwork. You and your two witnesses must appear before the town clerk to declare your intention of getting married. You’ll have a civil ceremony which makes it legal; then you are free to have a second ceremony at the location of your choice. Some of the special places for weddings include the town of Taormina with its spectacular views of the Ionian Coast and Mount Etna; a castle or aristocratic palace in Catania; and hotels like Hotel Villa Belvedere, Hotel Villa Angela, and many more. 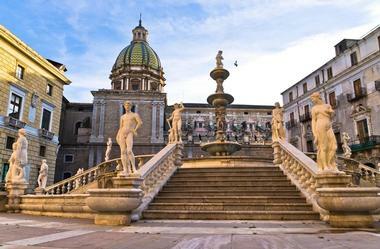 Sicily offers a wide variety of accommodations at affordable prices. 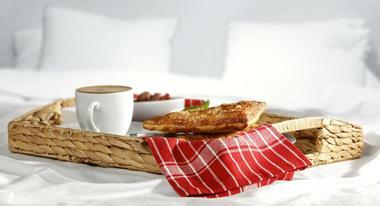 Even the most luxurious hotel room rates in Palermo will be 50% less than comparable rooms in Florence or Rome. 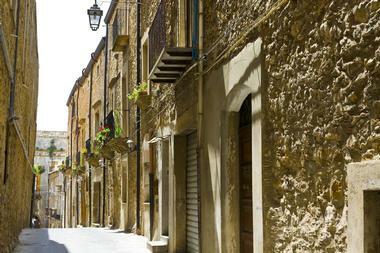 Siracusa is known for its historic buildings that have been restored as charming bed and breakfasts. Foresteria Baglio Della Luna is a restored feudal farmhouse, now a 23 room hotel in the middle of the Valley of the Temples. Hotel Giardino Di Costanza Sicily is a resort and spa set in olive groves, vineyards, and palm trees; the gardens have an Arabic feel. The Belmond Grand Hotel Timeo is filled with antiques, has views of Mount Etna, and sits near the ancient Greek Theater.